IMAGE: Katie Holten, Photograph of an excavated Cox’s Pippen tree re-erected in a shed in East Malling (Original photograph (1952) courtesy of David Johnson, East Malling Research, UK), 2005. On Christmas Day, artist Katie Holten posted this stunning image of an excavated Cox’s Orange Pippen tree, originally taken at East Malling Research in 1952. The Cox is Edible Geography’s apple of choice: it is “considered the greatest-tasting apple of all time,” according to food writer Rowan Jacobsen. East Malling Research, the U.K.’s leading fruit research institute, also holds a special place in the otherwise cold heart of this refrigeration-obsessed author for its pioneering work on the controlled atmosphere storage of apples. Over the millennia since the apple’s domestication, growers had tried to exploit spontaneously occurring genetic mutations that made the trees shorter and thus easier to harvest, grafting the best fruiting varieties onto these cloned dwarfing rootstocks. The first order of business of the new lab in East Malling was to respond to the demand from Kentish orchardists to improve and standardise the various dwarfing rootstocks then in circulation. Pomologist Ronald Hatton studied the relationship between a tree’s anatomy, its “vigour” (scientific shorthand for an apple tree’s growth, health, and fruit yield), and its rootstock, screening cultivars from across Europe to select and breed a series of freely distributed rootstocks, labelled in descending tree-size order from M1 to M9. IMAGE: The effects of commercially available Malling rootstocks on apple tree height and shape. Beneath the surface, invisible and, outside the industry, unknown, this single clone has reshaped the global landscape and economics of apple production. 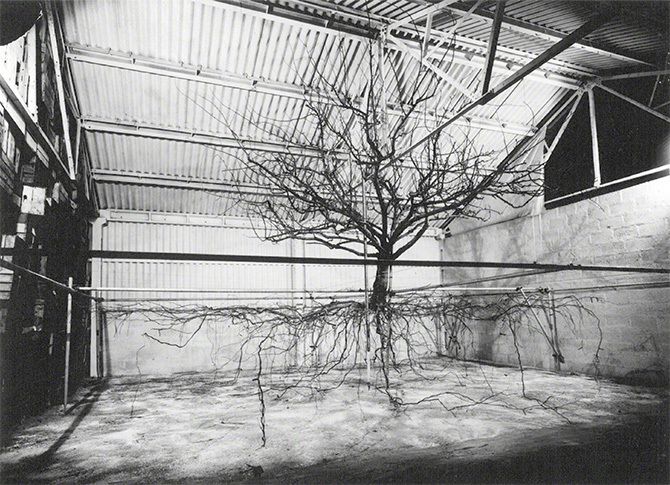 But, if the impact of East Malling Research’s rootstock studies is astonishing, the techniques developed for studying tree roots are, as Katie Holten’s photograph hints, equally arcane and fascinating. Wolfgang Böhm, a scientist at the Institut fur Pflanzenbau und Pflanzenzuchtung at the University of Göttingen, surveyed the history of root studies in his 1979 textbook, Methods of Studying Root Systems. He dates the first example of the traditional “skeleton technique” of dry root-excavation to the eighteenth century, when British clergyman Stephan Hales (who was also the first person to measure blood pressure) carefully dug around the roots of a sunflower in order to measure and weigh them. It wasn’t until 1926, Böhm writes, that the American ecologist J. E. Weaver “developed this simple excavation technique with garden tools into a recognized scientific method”—one that has remained largely unchanged ever since. To excavate a tree root, one must dig a trench, far enough away from the plant so as not to accidentally lop off any sideways-spreading roots but close enough so as not to create extra work. 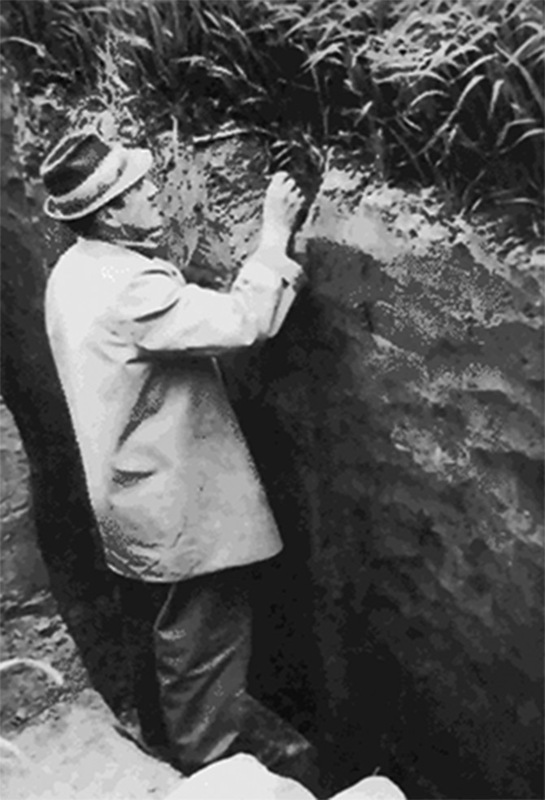 For the trench, backhoes and shovels are permitted; according to Böhm, “Cullinan (1921) used dynamite … but in general this technique cannot be recommended.” From then on, however, the soil must be removed particle by particle from the plant-facing side of the trench. A variety of hand tools can be used, depending on the delicacy of the root system: Böhm lists “ice picks, small metal forks, screw drivers, forceps, spatulas, small dental picks and sharp pointed needles of different sizes.” As if this process was not already painstaking enough, the root system must, Böhm specifies, be drawn on a 3D grid and photographed as soon as it is uncovered. IMAGE: Anonymous man excavates grass root systems using a needle. This photograph and the one below from Wolfgang Böhm’s Methods of Studying Root Systems. It’s hardly surprising, then, to read that “one man needed five weeks to excavate, measure, and record the root system of a 15-year-old lodgepole tree.” In all, Bohm writes, “nearly 60 tons of soil had to be moved in the excavation of a mature orchard tree” such as the Cox’s Orange Pippin, above. Nonetheless, over the years, the scientists at East Malling Research have excavated dozens of apple trees, raspberry bushes, and strawberry plants, in order to develop new rootstocks as well as observe the effects of soil type, orchard density, irrigation, pruning methods, and shading on the root systems and resulting harvest. IMAGE: East Malling Research’s rhizotron, an architectural device for subterranean observation. 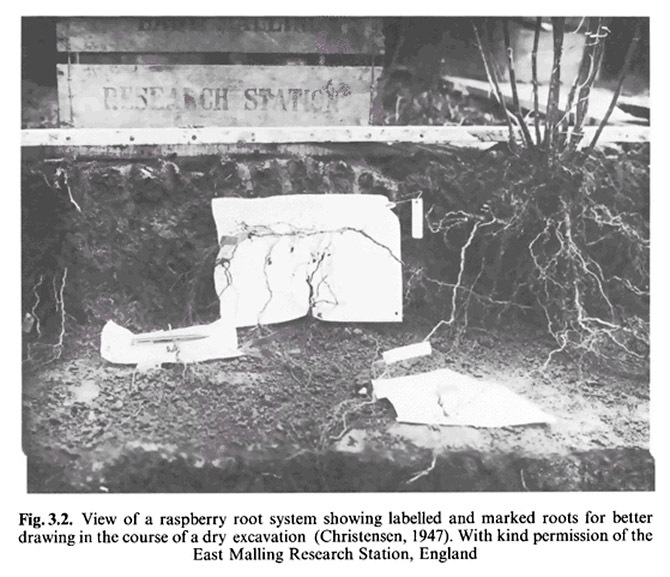 In the 1960s, East Malling Research supplemented the excavation method with the construction of the world’s first underground root laboratory, or rhizotron. 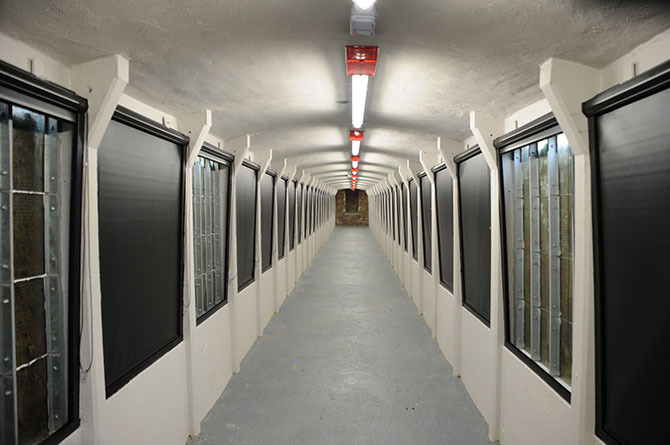 This is an underground corridor whose walls consist of forty-eight shuttered windows, which researchers can open to peer out onto the root systems of adjacent trees and plants. 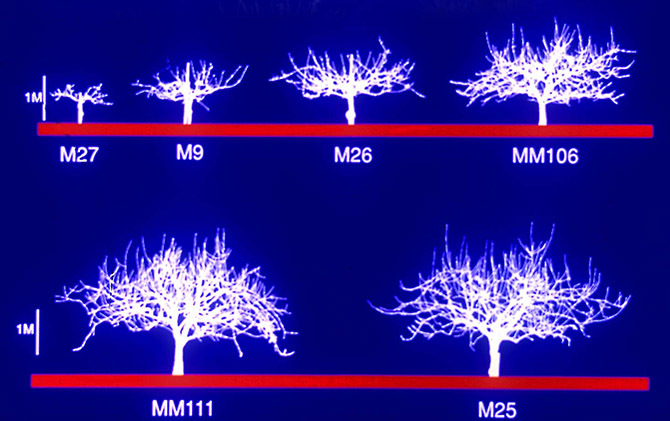 At East Malling, the rhizotron has been planted with a Gala apple grafted onto M27, M26, and M9 rootstock, and, while the resulting photographs and measurements only document a section of the tree’s root system, they have the advantage of allowing observations over time. IMAGE: Apple tree excavation, 2013, from the East Malling Research annual report. 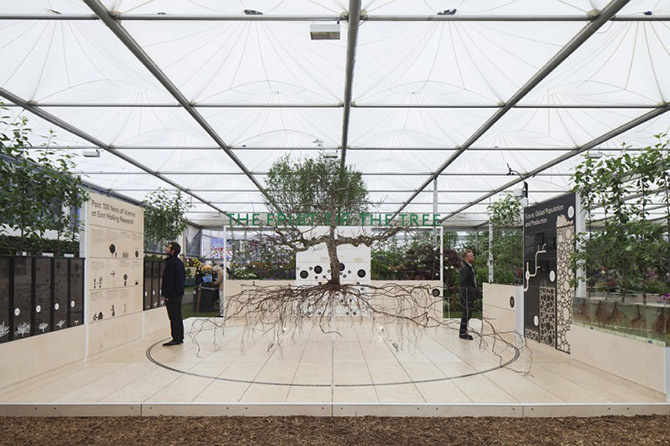 IMAGE: “Fruit of the Tree,” East Malling Research’s display at the Chelsea Flower Show, 2013, via. The tradition of dry excavation continues. Indeed, in 2013, East Malling Research won a medal at the Royal Horticultural Society’s Chelsea Flower Show—the first ever awarded to a scientific exhibitor—with a display whose centrepiece was a fully grown apple tree on M9 rootstock. 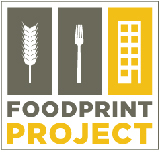 The video below gives a short glimpse of the process, which took a team of ten three weeks. I had always thought of the branching filigree of a tree’s root system as a spectral mirror of its aboveground architecture, but, as it turns out, it is in fact the rhizosphere that determines the shape of the tree that we see.